Be not afraid of life. Believe that life is worth living, and your belief will help create that fact. Editor's Note: I am discontinuing this page as a magazine. I will, perhaps include more features here, but it will no longer be pursued as a periodical. I need to devote my time and energies to other pursuits. Welcome to the first issue of "23". This is intended to be a publication dedicated to the arts that lie just outside the mainstream, avant garde, eternal network, and other things you just might not see every day, and may not be aware of their existence at all. This issue and the following three issues will feature as the main article, pieces about mail art. The first three issues will present the archives collected as the result of three mail art "calls" issued, I think, during 1999. The fourth issue will present selections from my collection of mail art post cards. Issue number five will feature my series of 3 X 5 collages. This is tentative, however. If I receive contributions I think are of more interest than what is currently planned, I'll substitute for either the post card or 3 X 5 card issues and push them further into the future. It's tempting to put an extensive quote from James Joyce's Ulysses and just let the readers wonder, but I will refrain for doing so (for now). Instead, I will refer you to an article titled Postal Art History. It explains how mail art came about. That's good for a historical perspective, but what is mail art? The Internet abounds with information as to what mail art is and how it works, and is replete with archives and projects all in some manner or other related to mail art. My own links page has several links to mail art sites. Mail art, simply put is art conveyed from one person to another via the postal service. Mail art, more particularly is a way for "artists" to distribute their work to other "artists" who in turn send their art out on the "network." Mail art takes many forms. Some people merely glean addresses of willing participants from various sources (there are several Internet web pages with such address lists) and begin mailing them things. In a simple form, mail art can be just an embellished envelope or post card. It can be more elaborate, too. On one occasion, I mailed out a series of 1 liter postcards -- 1 liter club soda bottles, shorn of labels and filled with a variety of materials and outwardly decorated. I have received baseball caps with postage and address labels affixed. The possibilities are limited only by the mail artist's imagination and the post office's willingness to handle the material. Another "genre" of mail art is the mail art "call." This method results in a themed collection. How this works is someone decides on a title and parameters for a "call" and propagates this "call" in whatever manner he sees fit. You can mail inserts to all those you send any other mail art to. You can post notices in any of a large number of publications that are typically read by mail artists, and you can send out e-mail notices and post "calls" on web sites. This will usually result in anywhere from several dozen to several hundred responses, depending on how widely the word gets out. Usually, the project is documented in some manner and participants receive copies of said documentation as proof of their participation. Exhibitions are frequently mounted of the submissions to these "calls." The Monroe County Community College of Rochester, New York sometimes puts up an exhibition of mail art works from their own "call." There are even museums popping up to house such collections. 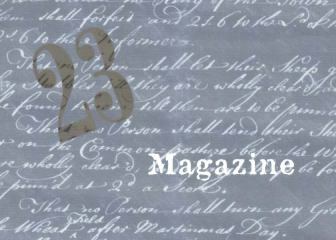 This issue of "23" is centered around a mail art call titled "Cash 'n' Carry." It was begun in 1999 and concluded on May 23, 2000. Through a long series of events that delayed any presentation of this project to the public, this project resided only in a series of boxes, envelopes, and folders until now. Enjoy! Please comment. The Wallpaper of the month is called "At the Galaxy's Edge." It was generated using one of the fractal generation programs and hand-tweaked to my own specification. This is the wallpaper I currently have on my windows Desktop. The poetry this month is from Sharel Brown of Baltimore, Maryland. Sharel is a poet/artist/curator. She recently got her Masters Degree from Christie's in London.